I’m often asked about my daily skincare routine. My day to day routine is pretty consistent and basic, but the number of products and labor intensity varies according to mood, time and how lazy I am. I’m lucky to have a relatively low maintenance skin, the problems I do have are that of dark circles, occasional acne, and dry/sensitive skin. I feel that I have a very healthy mix of drugstore and cosmetic counter (department store) skincare products. I don’t prefer one over the other and often look for cheaper alternatives that are available. Oh don’t quote me on the prices listed below because I have a small brain =P Do keep in mine that everyone’s skin is different; one product that works well for me might not work for you, and vice versa. With that said, I’m going to show you my daily skincare routine, starting with night time. For my daytime skincare routine go here! First thing I do when I get home everyday is to remove all makeup on my face. Last product I used was Clinique’s Take The Day Off Cleansing Balm (around $35). I can not recommend this product enough. It is in solid form and the product melts as soon as it comes in contact with your skin. You just use a cotton pad to pick up some of the product and wipe the makeup off your face. It is easy to use and works like a charm! After finishing the 125 ml jar (which lasted me about 7 months!) 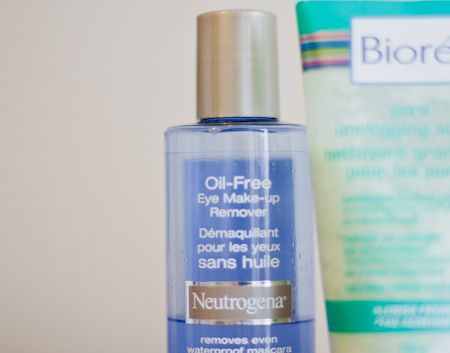 I looked for a cheaper replacement, and found Netrogena’s Oil Free Eye-makeup Remover (around $8). It is also easy to use, gentle, highly effective, and there is no scent! I’m actually very happy with this product, and as much as I love Clinique’s Take The Day Off Cleansing Balm I think I will stick to this one until I become baller LOL (AS IF). When it comes to face wash, all I ask for is that squeaky clean feeling after washing my face. 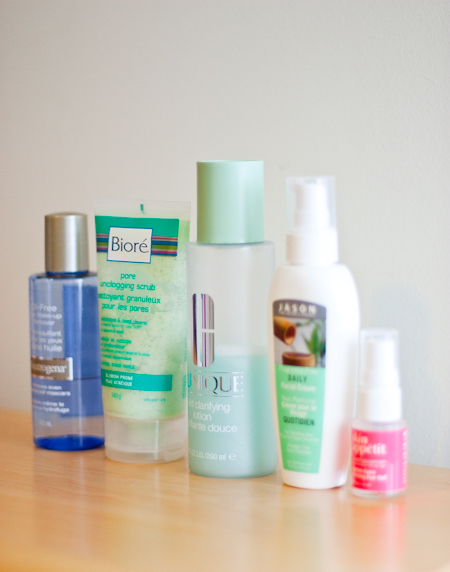 Right now I’m using Biore Pore Unclogging Scrub (ranging from $8-$11). Though there are lots of scrubbing beads inside, it isn’t really a scrub and feels more like a cleanser. It has a little cooling effect that leaves your skin feeling refreshed. It contains 2% salicylic acid and claims to prevent future breakouts, but I don’t really see that. 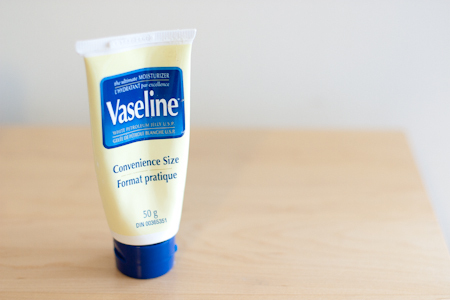 Overall a great drugstore product and will most likely repurchase. I’m using Clinique Mild Clarifying Lotion ($15) both night and day. Unlike many other Clinique toners, this one does not contain alcohol. Anything with alcohol in it is just way too drying for my skin, especially in Canada! While it does that job, I don’t see anything special with this particular toner. I probably won’t repurchase and will look for something else when I’m through with this bottle. Suggestions? I only started taking care of skin around my eyes couple years ago, and I often forget to use my eye cream =P Right now I’m using Skin Appetit Optim-Eyes Firming Eye Gel ($8-$12) and definitely happy with it. It is paraben free, smells lovely, and very moisturizing! I use Jason Fragrance Free Daily Facial Cream ($8-$10) for night time, but not in the morning because it is a little too thick for a day cream. It leaves my skin soft and moisturized, but not oily. I also like that it is natural and fragrance free, so I don’t need to smell the fragrance falling asleep. That’s all for my night time skincare routine, for my daytime skincare routine go here! DISCLAIMER: Brands mentioned are not affiliated with What Annie Wears in any way nor is What Annie Wears affiliated with them. All opinions expressed are mine. Others’ experiences with the products may differ from mine. Many people think that thrift stores are dark, grungy, smelly and cluttered places, but that’s not entirely true (just look at Front and Company)! There might be a few like that in every town, but for the most part, thrift stores are fairly clean, bright, and well organized. Thrifting can be great fun, and if you’re into vintage stuff, you can find some really cool stuff for cheap. So here I’m sharing a few tips with you on some basics to thrift shopping! To me, the most important thing before and after entering a thrift store, is to keep an open mind. You never know what you can find! Don’t be afraid of used, the majority of items that end up on the racks are in perfectly good condition. Look through every rack. Sometimes thrift stores can be a bit overwhelming, but you just might find that perfect blouse buried in piles of stuff you’d never consider buying. Think of it as a journey, be patient. Get a basket when you enter the store, pile on the maybes’ as you sift through the racks. Decide later if you want to keep them all. A lot of the times when you want to go back to find that sweater you saw 10 minutes ago, it’s long gone. Think alteration, repurpose, and ways to wear it! Look beyond the surface. A long skirt can be cut short for a different look, shoulder pads can be removed, and scarves can be worn as headbands. It’s hit or miss with thrift stores. The good thing is that the inventory changes all the time, so if you don’t find anything this time, try again in a few weeks. I like going to the thrift store with a friend who knows my taste. Two set of eyes are better than one. But I find that I pick out unique items when I visit the stores by myself. I guess if you have been thrifting for awhile and know your stuff, then it’s perfectly fine to tackle it alone. Unless you know for sure something will look good on you, TRY IT ON. If you know me you know that I hate trying clothes on in the stores (just can’t be bothered). So I made the mistake of not trying things on when I first started shopping at thrift stores and ended up with several items that looked cute on the racks but ridiculous on me! Okay so I think that’s it for now. I will probably write more about thrift store shopping in the future as I really enjoy the experience. I’d like to think that the pieces I find at thrift stores traveled through time and space, to become one-of-a-kind, fated-to-be mine items. How romantic?